Reliance Jio might extend the popular Jio Welcome offer that will provide free services till March 2017 to reach the 100 million subscribers target it has set. We must admit that Reliance Jio had absolutely changed the telecom market, Jio is offering the plans that no one even dreamed! Reliance Jio aims to offer high-speed mobile Internet to the 90% of the Indians along with the free voice calls and messaging services. Recently we have also heard the news that Reliance Jio’s Lifetime free voice calling offer gets the clean chit from Trai. Therefore, there is no need to pay any more for calls. Reliance Jio had already dominated the market which left competitor to struggle in the telecom market. 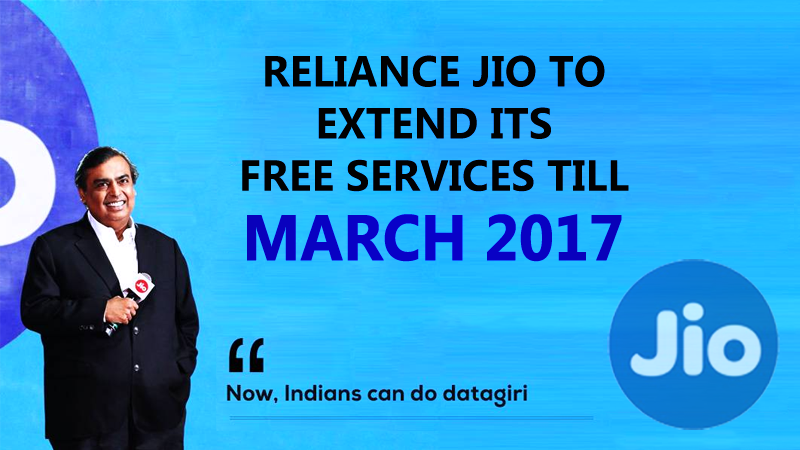 Here’s another big news for Reliance Jio users, Mukesh Ambani’s Reliance Jio with its free services is reported to be extended till March 2017. Previously Reliance Jio’s unlimited offer was slated to December 31st, 2016. However, recent news suggests that there is the possibility to extended the free services up to March 2017. “Mass scale free welcome offer could continue until March 2017 to attract subscriber growth towards the celebrated 100 million mark with RJio’s indicative data pricing at Rs130-140 per GB”. TRAI doesn’t allow to extend an existing offer/plan which promotes free services for more than three months. Jio’s head of strategy and planning Anshuman Thakur said they don’t need permission from TRAI to extend free services beyond December. Reliance Jio also hinted that if Jio can’t deliver the services it promised to its users then it will be unfair to charge the customer. The analyst also added that if the problem with interconnection doesn’t improve then it may look at “innovative solutions” to prevent customers from paying for bad services. Therefore, it’s still not clear whether users will get the free services up to March 2017. However, Reliance Jio had shown us nothing is impossible, lets hope for the best.